For all of the crazy detailed, tutorials I have shared here, with lots of steps and tons of testing on my part, I equally love super simple, one step DIYs, as well. 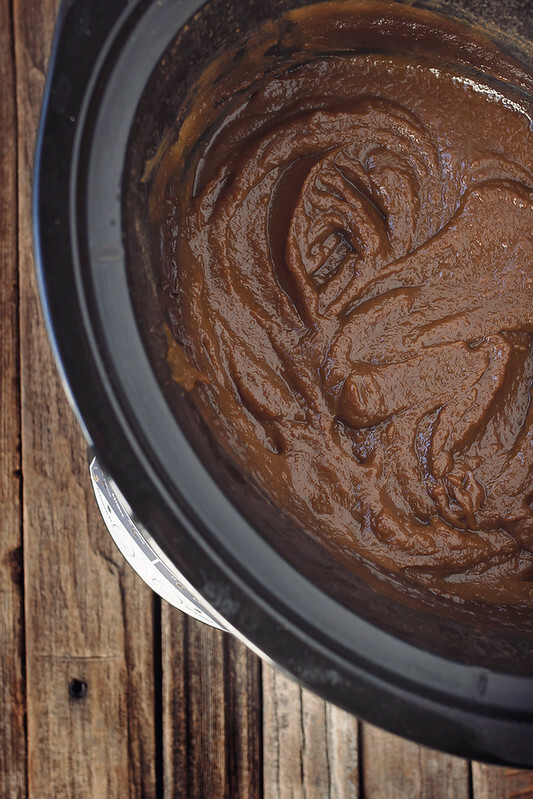 This week I show you How-to Make Crock Pot Pumpkin Butter and it seriously couldn’t be any easier. 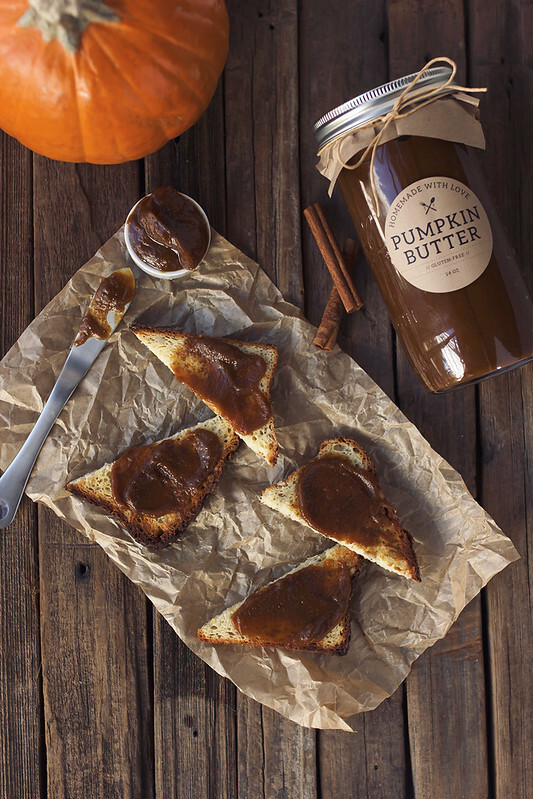 Let’s first clear the air for those of you that don’t know… Pumpkin Butter has no butter in it. No dairy of any kind. Discuss. Seriously though, it’s just that it’s thick like butter I guess? I don’t know who came up with the name. This super simple recipe requires very little of you. You literally dump the ingredients into your crock pot, stir, turn it on, let it cook. Done. 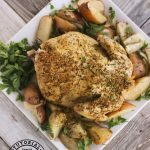 I find the crock pot to be easier than the stove top and because it cooks low and slow, I like the flavor so much better. I do suggest still keeping an eye on the crock pot, since it can stick and you do not want scorched, burnt pumpkin butter, it won’t taste good that way. 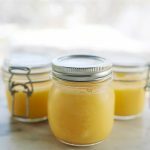 I personally recommend fresh pumpkin puree, which is stupid easy to make and provides the best flavor, but canned pumpkin will also work perfectly, I have made it both ways and they are both crazy delicious. This homemade pumpkin butter is literally fall in a jar. The way it smells and the way it tastes, it is everything that is so right about this time of year. Since living in Southern California means I cannot have the beautiful colorful leaves, the crisp cool air, that incredible aroma of fall in the air, then I guess this will have to do. This Crock Pot Pumpkin Butter is smooth, thick and creamy and tastes very reminiscent of a pumpkin pie. 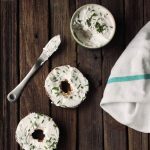 This tasty spread also makes a really thoughtful gift, especially if you make the jar all pretty and add some personalized labels (there is a free download below). Add all of the ingredients to your slow cooker. Stir very well to combine. Cook on low for approximately 6 hours, or until thick (this time may vary based on your slow cooker). You may have to stir it several times throughout the cooking process if it sticks. You don’t want it to burn. Every slow cooker is a bit different in how strong it is. At the end if it hasn’t thickened as much as you could like, take the lid off and let it cook a bit longer and it will reduce further. Store in the refrigerator for approximately 2 to 3 weeks, it can be frozen for up to a year. 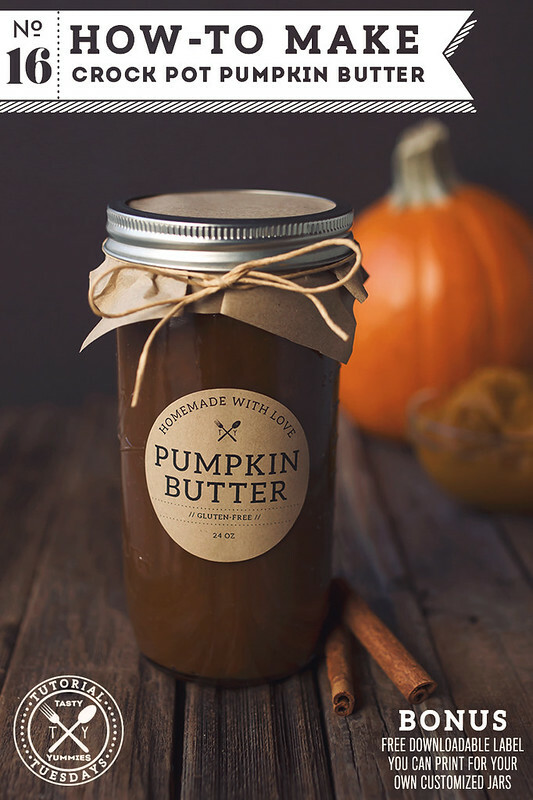 **please be aware: due to the lack of acidity, the USDA does not recommend that you preserve pumpkin butter by canning it. 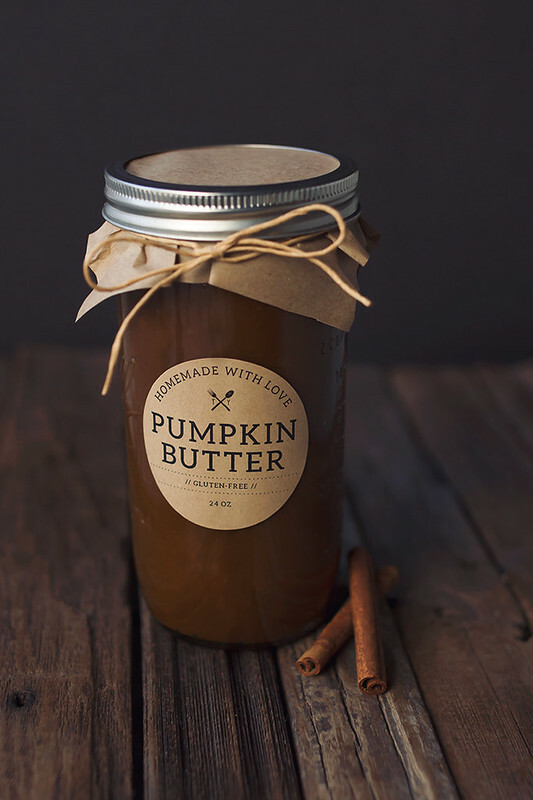 Here’s a great post from Food in Jars on why pumpkin butter can not be canned. 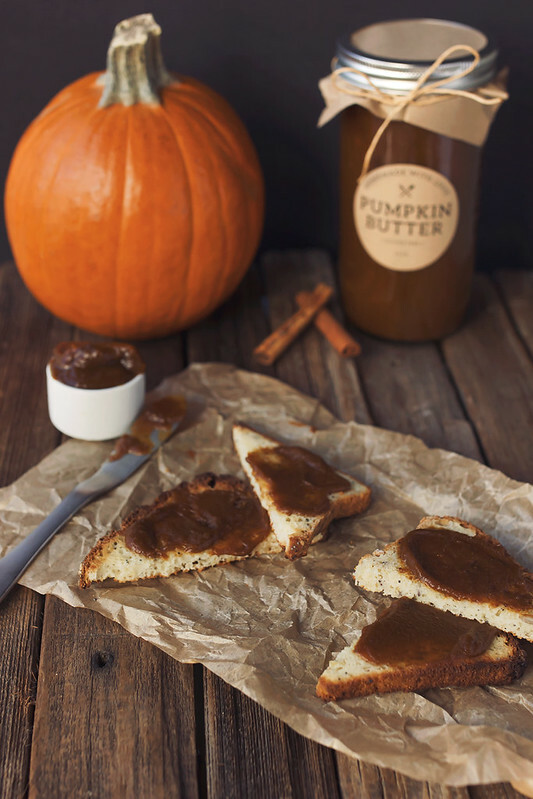 in place of jam on a PB&J sandwich, in fact try an almond butter and pumpkin butter sandwich. you’re welcome. Download a customizable version of these labels to print at home to give your homemade pumpkin butter an extra-special personal touch! Grab your printable PDF, simply write your name in under “by:” and fill in the size of your container. That’s it. DOWNLOAD HERE. This post contains affiliate links. Beth of Tasty Yummies is a participant in the Amazon Services LLC Associates Program, an affiliate advertising program designed to provide a means for sites to earn advertising fees by advertising and linking to amazon.com. This looks so tasty Beth and such a great gift – I’m sure anyone would be chuffed! LOVE it! Especially the part about “BAM Pumpkin Spice Latte!” I am so in love with that pumpkin almond milk recipe that I want to make it every day and drink it with my coffee. And I wouldn’t even feel bad doing that. 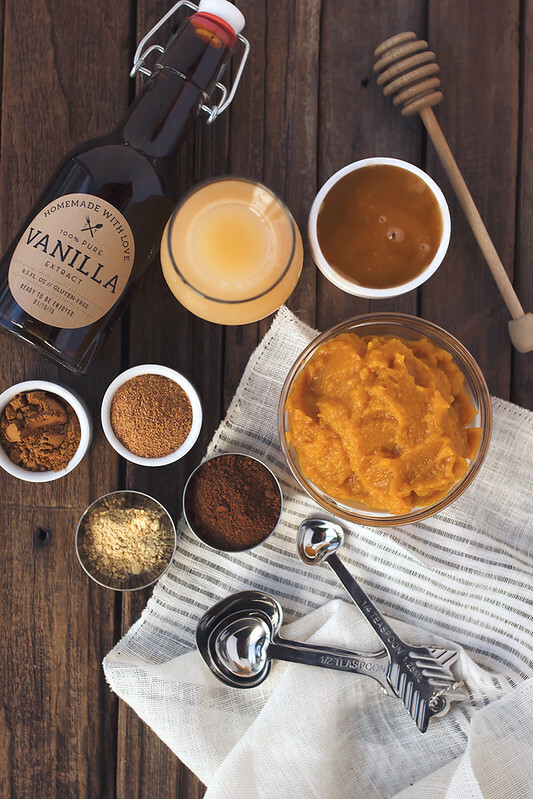 I love that the pumpkin butter is PSL “concentrate”. Awesome. I’m not tired of pumpkin in any way yet. Keep it coming! This looks great and I’m thinking about making a double batch for Christmas presents! I love the idea of adding bourbon – how much would you suggest I add? I made a larger portion/batch and it’s not thickening up. Do I need to cook it for a lot longer because it’s such a large batch? I’ve had the lid off for the last hour and it’s still doesn’t look right. Thank you! Hmm, did you use fresh or canned pumpkin? If it is fresh, maybe it just had a bit more water than a canned pumpkin might? If it still won’t thicken, it may just be that your slow cooker doesn’t get as hot as mine did, you could also add it to a pan on the stove to reduce it further there, I know it defeats the purpose of the slow cooker, but that way it will at least be nice and thick. Slow cooker recipes are so hard, since the power of the cookers can vary so wildly. Maybe next time cook on a higher setting? I am excited to try to make the pumpkin butter but I had a question. I have a spice blend that as al the spices I need for it blended together. Do you think I could use that instead of each individual spice? If so how much of the blend should I use? Beth, I made this yesterday! It is to die for! So delicious. My daughter is visiting for the holidays and we were eating it right out of the crockpot. So easy to make and so incredibly yummy! Thank you! That’s so great to hear Mary-Alice, that makes me so happy. Thanks for taking the time to comment. Thank you! Can’t wait to try this! Also, love your labels. Would you mind sharing the fonts you used? I would like to use them for additional labels for my canned goods! Thanks! How long will this keep since it cannot be canned? My pumpkin butter LOOKED like the pictures and smelled AMAZING, but tasted really bad. Unfortunately I had to throw it away. Not sure if I would have fared better using maple syrup instead of honey, but I don’t know if it could have made that much of a difference. I think I will stick to crockpot apple butter! What tasted bad about it? Not sweet enough? I am sure it could have been saved with more sweetener, rather than throwing out, if that was the case. I wonder if you could substitute Pumpkin pie spice in stead of all the other spices???? Of course, yes, I just prefer to add my own spices to add more or less of my favorite things, but by all means, a pumpkin pie spice would work just as well. I am so going to make this tonight, and tomorrow? WAFFLES! Wow your pictures are amazing and totally making me drool. I bought some Pumpkin Butter from the store a few months ago. I’d never heard of it before. Now I’m addicted and so I’m going to add this to my have to make list. Made this last night/this morning with the vanilla and honey. I wasn’t attentive enough and it did burn… 🙁 I guess it wasn’t too bad (or I’m just crazy… y’know, whatever), as I’m still eating it. I was skeptical of pairing pumpkin with peanut butter, but it’s an amazing pairing! The peanut butter (or bread) actually manages to drown out the tinge of burnt sugar. Or maybe I managed to slop only non-burnt stuff on the bread. No idea. Either way, I can see great potential in this! The spices are STRONG, and I LOVE it! Tastes like pumpkin pie filling (and the burnt sugar reminds me of stuff that burned on the rim of the pie tin). I’ll probably try it again one of these days now that I have a better understanding of what to do, but for now I will enjoy my less than perfect batch. Thanks so much for the recipe! I am sorry to hear it burned. Were you cooking on high or low? I was cooking on low, stirring every few hours. Our crock pot tends to burn things in the bottom corners of each side no matter what temperature, though it seemed like this burned all around the edges, too. Maybe I should try liners? Hmmm, I have never used a liner. I think unfortunately with the varying temperatures of crock pots and slow cookers, it could simply be the result of a strong slow cooker. I am sorry that happened. You made me lol. Yes, right out of the jar! I’m hoping to try this using coconut sugar instead of honey or syrup, for a more “diabetic friendly” version. 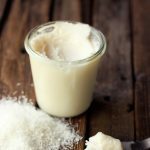 Any reason you can think of that the coconut sugar won’t work? Nope, I think that coconut sugar will be great and it’ll bring such a nice deep, flavor. When storing in the freezer, what is best to use for storage (container, bags, etc.)? What have you had the best experience with? Can this be doubled or tripled as long as you have a big enough crock pot? I was wondering if you have ever used this pumpkin butter as a substitute to pumpkin puree for a pumpkin pie? If so how did it turn out? I haven’t really, though it would depend on the recipe. With it being sweetened and already spiced, you would have to take that into consideration. I am curious how to store this if I am going to freeze it. I love the idea of making a large batch but I don’t want to can it and can only use it so fast. I know it is unsafe to use glass or plastic in freezer, is there a better way to freeze it? I was looking for pumpkin recipes to use up what I canned last fall. I made this today and it’s delicious! Thank you for sharing. I know my crockpot cooks hot (all the new ones do unfortunately) so I just set a timer to remind me to stir every half hour. Now I need to check out your other recipes. I have a quick question regarding the pumpkin butter. Once it is make and canned does it have to be put in the refrigerator right away. We wanted to make this for a bake sale but we’re not sure if u could wait to refrigerate. I’ll be making this, for sure. Being lazy as all get out, I’ll be using canned and PPS, especially since I shop for sales on pumpkin puree and stock up each time. So many good cooking recipes can use this very useful, virtually tasteless on it’s own, squash for sweet or savory dishes & the canned keeps for a long time! If you’re in CA, or anywhere natural disasters strike, it’s a great addition to your emergency supplies! Also, this looks like an amazing filling for tarts and a large variety of thumbprint box cake mix cookies, particularly a yellow cake mix, with maple syrup & pecans, devil’s food or chunky peanut butter & more! My imagination is growing that list exponentially as I write! For the box cake mix cookies, I use pumpkin puree and nothing else but the extra flavorings, if I want to change them up more with spices & additions like nuts, mincemeat (with apple pieces, raisins, cinnamon, nutmeg, cloves, etc., it’s an outstanding addition to oatmeal, cookies, spice & carrot cakes, etc. ), craisins & more. Great texture & moistness for cookies & muffins, too! I would love to make this, however I cannot have apple juice (I am on a low-FODMAP diet). Do you think that I could use Bourbon in place of that? I wasn’t sure what cooking an alcohol for that long would do to the flavor… I want to make this in order to make the Dark Chocolate Pumpkin Tart recipe you recently posted! Beth I have always steamed my pumpkin in the past, and it was a hot messy job! A few years back I tried baking it – and it was much too dry! This year I’m trying your crock pot method, and I’m hoping that its as easy as you predict – and it is so far, it’s cooking in the crock! As to the moisture level, my mom-in-love told me many years ago that she hung her puree in a thin cotton sack for several hours over her laundry tub, allowing it to drain naturally to preferred pack. Of course, she had a nice cold basement in northern Indiana. 🙂 So, mine I place in a cotton lined colander over a large bowl in the fridge. Now for those pumpkin seeds…! Do you know if I can use regular syrup or does it have to be pure maple syrup? As long as it’s real maple syrup and not the flavored fake stuff, it should work great.